Online retailer Touch of Modern (‎@TouchofModern) is known for its cutting-edge lifestyle products, and its customers visit to discover appealing items. 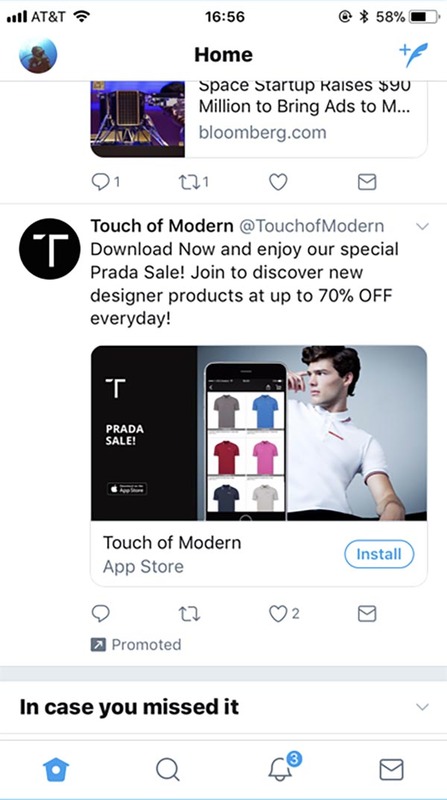 For its promotion launch of Prada clothing, Touch of Modern wanted to cost-effectively drive app installs, signups, and purchases from its target audience of affluent males between the ages of 22 and 55. 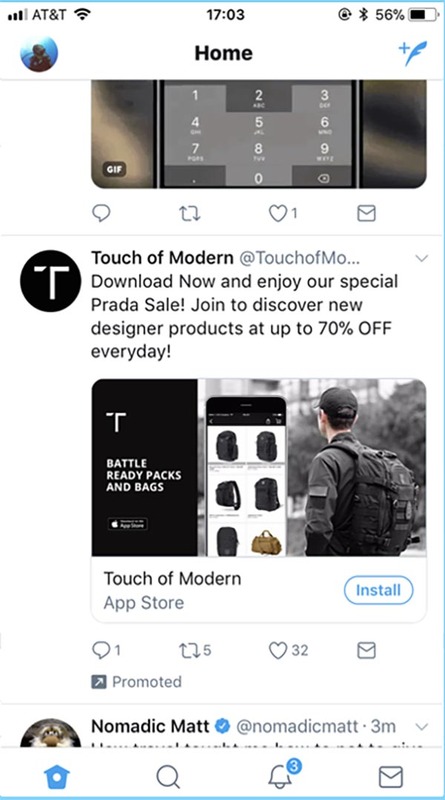 Touch of Modern and its mobile advertising partner used Twitter's Mobile App Promotion solution to reach its target audience while cost-effectively driving app installs, signups, and purchases. To promote the Prada sale, the brand used the 1.91:1 Image App Card ad format. 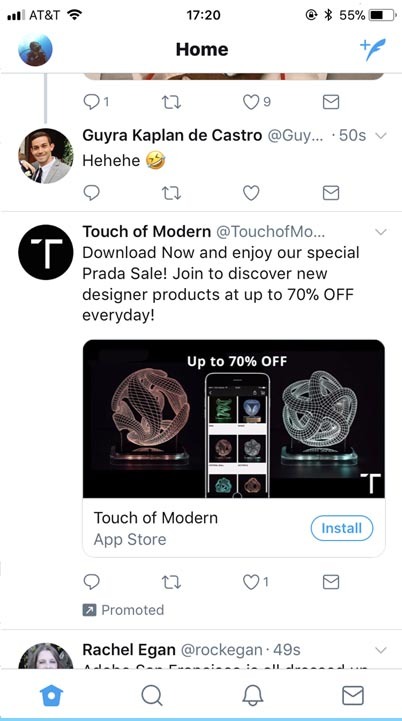 This allowed ‎@TouchofModern to captivate its audience’s attention by using a combination of first-party and Twitter data for lookalike targeting. Touch of Modern is a curated, online shopping destination for men to discover extraordinary products to elevate their lifestyle. Use quality data to target audiences. To reach its most valuable audiences, ‎@TouchofModern used first-party purchase data from existing customers and leveraged Twitter’s lookalike targeting to find similar audiences. In addition, keyword targeting helped reach audiences who were already interested in the brand. Touch of Modern designed sleek and compelling creatives that would catch the attention of fashion-forward audiences interested in the Prada sale. 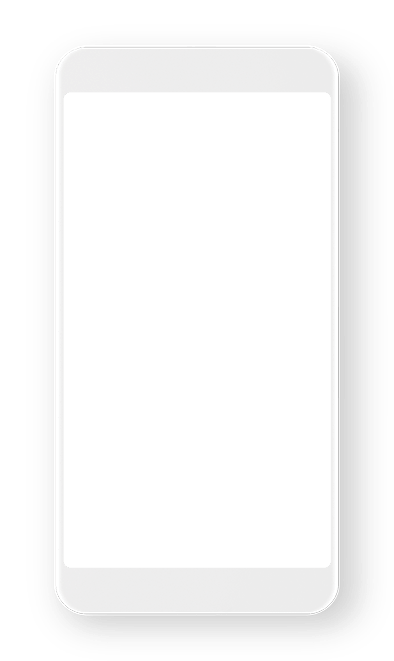 The brand ended up driving highly cost effective CPIs and app signups using the Twitter 1.91:1 Image App Card, which has a larger image, and clear and direct Tweet copy. Touch of Modern tested new formats and targeting strategies. After analyzing performance, Taptica determined that the best-performing combination was the 1.91:1 Image App Card with lookalike and keyword targeting. These findings allowed Touch of Modern to quickly shift its campaign strategy and deliver optimal performance. High-quality data sets and the 1.91:1 Image App Card format were extremely effective, and the campaign beat all of the targets the retailer had set. This included a 69% signup rate and an impressive 110% ROI by day 30, which beat expectations by 10%. Touch of Modern was so impressed with the campaign’s excellent performance that it shifted spend to Twitter and extended parts of the sale.